From its commercial city towers and old colonial-style buildings to its beautiful beaches, the multi-faceted city of Cochin tempts you to lace up those boots, pick up your backpack, and jump on a ferry to taste the flavours of Kochi. Best visited post monsoons, between the months of October and February, the soft drizzle and pleasant weather of Cochin leaves you wanting more of this wondrous place. It is located along the Arabian Sea on India’s western coast and provides you with a unique view of the country and its influential colonial past. All you need for your one-day adventure is your unending thirst for exploration. 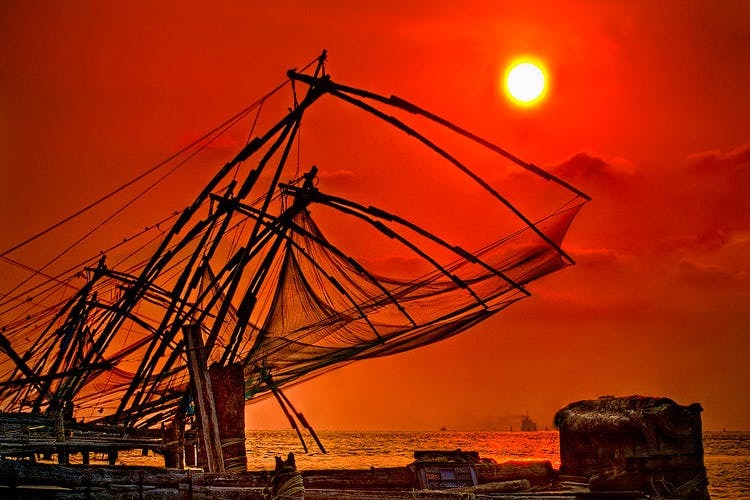 Start the day early and take a morning walk in Fort Kochi and experience the hustle-bustle of local life. You will see local butchers at work, hens being tended to, and old couples sitting on their porches reading the day’s news. Dotted with old European architecture, Fort Kochi exhibits its colonial charm and eases you into the medieval comforts of South India. Stroll through the colourful flower-lined lanes along the parade ground or pop in to join a quick game of cricket. You will feel like you are in Sussex until the tropical weather gives it away. Take a break at Fort House Restaurant and breakfast on some seafood with a view of the blue sea. Continue your walk until you see the coastline where the Chinese fishing nets are being cast out into the sea. Used for over 500 years, these nets are something that the fisher folk love to tell you stories about. The fishermen give credit to Kubla Khan and Zhang He, the Chinese explorer, for bringing in these nets, while historians claim the Portuguese were the source. Irrespective of where they come from, it is an experience worth having to help the fisherman lower these nets into the waters. Speed up and find yourself a spot on a car ferry with the locals, and get off at any of the numerous islands Kochi has to boast of. Vypeen or Willingdon Islands shouldn’t cost you more than Rs 5 to get there, where you can enjoy a view in the morning sun and the gorgeous beauty that Fort Kochi is. It is safe to say that #foodporn was invented for places like Dal Roti where the juiciest kathi rolls are served. Your taste buds will do a dance on the first bite. Meat and vegetable options are methodically wrapped in a flaky paratha that are fried to perfection. Take off your shoes and walk along the flag-stoned floor, while enjoying the whitewashed walls and elegant woodwork of the 500-year-old St Francis Church. Known as the oldest European church in the country, it is also popular for being the initial burial place of Vasco de Gama. Although known for its tea, the country’s Malabar Coast is also popular for its coffee. None of the restaurants serve it because we Indians drink our coffee weak, which is why the coffee is exported. Sharpen your nose and head to the South bus junction of Ernakulam, where you will smell the sweet yet thick scent of roasted coffee inside a cave-like store with a large wooden counter. Pack the beans or buy the fine powder at Leela Coffee, located on Chittoor Road in Valanjambalam District. Be it boutiques, antique shops, or the roadside vendors, you can shop to your heart’s content for jewellery, souvenirs, and fabric on Jew Town Road. It is a dreamland for fabric, which you can get tailored into outfits of your choice. The Jews of Kochi settled in this area during the 12th century, where today stand the colonial buildings filled with handicrafts and antiques. If you don’t like fish dishes, tasting Kochi’s fish curry will instantly change your preferences! The fish are caught fresh every morning and cooked in a flawless blend of spices and herbs, which produces a palatable aroma. Step into any of the restaurants or homestays Cochin and expect the best service along with soul-touching food. A culinary experience you will always treasure!